Le Beau Mâle is billed as a fresher take (a mix of “hot” and “cold” notes) on original Le Mâle. Flankers come and go in the Le Mâle fragrance line and since I’m not a huge fan of the original perfume, I’ve paid them little attention (except for occasional sniffs if I see tester bottles at department stores). The Le Mâle flankers I have sampled have often been so closely related to Le Mâle that they are “worthless”…unless you want an army of slightly different Le Mâle torso bottles on your dresser. Upon application, Le Beau Mâle smells like Le Mâle — but diluted with le mouthwash. From the start, Le Beau Mâle, so minty!, smells like “product” more than perfume (Le Mâle is luxurious in comparison). Le Beau Mâle’s lavender and wormwood are menthol-y, and Le Beau Mâle’s “bracing” accord, mint-lavender-wormwood, gives the perfume a sport fragrance character through mid-development. I don’t find, as Gaultier or Kurkdjian would have me believe, any “heat” or “ice” in this fragrance — Le Beau Mâle is lukewarm. Le Beau Mâle’s base is comprised of an oft-used men’s perfume formula: wan vanilla/tonka bean, FRESH “wood,” and light (white?) musk. As Le Beau Mâle develops it smells more and more like Le Mâle, but Le Mâle on a budget. I keep thinking of Francis Kurkdjian in the Le Beau Mâle videos, being asked to describe the fragrance, and nervously spouting disparate cultural references — “baby, take off your shoes”…Brando!...“baby, take off your dress”…Lady Chatterley!... “yes, yes yes…” cartoons!…“you can leave your hat on….” Kurkdjian must be wondering how many more times he’ll be called into action by Jean Paul Gaultier to make something new out of something old. Hasn’t the Le Mâle franchise run its course? 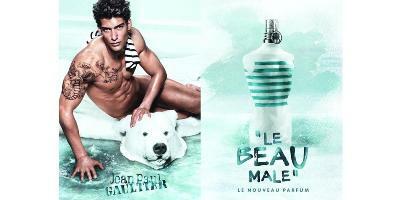 Jean Paul Gaultier Le Beau Mâle is available in 75 ml ($64) and 125 ml ($85) Eau de Toilette. *Notes: wormwood, mint, lavender, sage, orange blossom, vanilla, sandalwood and musk. Oh, Kevin, I can immediately recognize your writing, even before checking the by-line of a review. Given that Gaultier insulted a total stranger for wearing “ugly” boots to a cafe, in terms so vile that he ended up with a criminal conviction, he should really, really not allow such hideous ads to go out under his name. There are really somethings that not even “the kindness of strangers” can forgive. I also would be careful to cite “You can leave your hat on” (a witty flirtation song composed, by Randy Newman) for a perfume whose “face” should have at least kept his own torso on. I’d feel sorry for the guy, having been all hair-gelled up and given a “sharpe tattoo”, just to stick his hand in the water, while petting what seems to be a toddler’s white polyester “teddy bear rug,”. However, the image is so photo shopped that I doubt the model actually was present on the rug, near any water, or actually had any of those markings on his shoulder. Dilana…it’s a tough gig being a model! Let’s hope his paycheck was compensation enough for any shock at his appearance. John Galliano was not convicted for insulting someone because they were wearing ugly boots but for spouting a stream of ‘antisemitic and racist insults’. It wasn’t that person’s boots he objected to; it was their physique. Ooops, I had actually googled this to double check before posting and must have landed on a report that confused the two. I hereby completely apologize to Monsier Gaultier for my false accusation about his history. I still think it is a horrible photoshopping job. Dilana: his legs look “baked”…like human drumsticks. So your verdict is mediocre-bad:) I have a decant of Le Male which I enjoy very much but haven’t given much attention to the flankers, except for finding Le Male Terrible to be an extremely wan version of Le Male. The strange thing is that this one turned out to be a scrubber on me. I so seldom encounter scrubbers that I almost always test on my skin: if a perfume is blah, I’m able to just ignore it. In any case, I had to rush to the bathroom to try get this off my skin. Hard to say why since the notes look quite ineffectual. Merlin: there is one element in this that is a ‘broadcaster’…an amplifier…maybe that made you run screaming to soap and water! It happened for me in the fragrance’s mid-development…but I had to leave it on, of course. Ha! Is that a particular aroma-chemical? My skin rushes through stages so the top notes for me would probably be midway ones for others:) My sympathies for having to keep it on! Merlin, it sure is nothing I’ve encountered in the natural world! ha ha! The model’s face is a bit JFK Jr-esque, think I’ll focus on that and ignore the rest of this silliness. Even the conversation during the French Taunting in Holy Grail seems to make more sense. One of my favourite bits of film especially as an example of useless conversation: ” Your mother was a hamster and your father smelled of elderberries”! Feral: it does seem Gaultier isn’t all that concerned with quality of ingredients…there is an artificial vibe, but it never seems “intentional” to my nose…not as if “that’s the point…artificiality.” But, this line of scents has HEAVY-DUTY fans! Kevin, you are a genius. In thus particular review you’ve summarized exactly how I feel about the state of today’s perfumery and its marketing. And yeah, Le Beau Male is Le Blech/Blah Male. Dusan: HA! Glad to oblige!. I am not a fan of the original either, and have not been enticed to even sniff any of the flankers, or anything by JPG for that matter. Is there even 1 other fragrance he does for men outside of the Le Male line anyway? Rictor…there are a few, Kokorico, an Eau se Cologne and Gaultier2…haven’t seen any of those but the Kokorico at stores here. Disappointed to read this isn’t good. Was gifted a bottle. So agree with you: hateful campaign, unattractive model, completely irrelevant fragance. Very funny review Kevin!